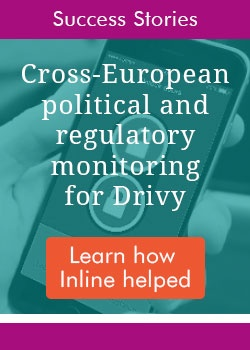 Inline Policy provide political and regulatory advice to some of the leading tech companies in the mobility sector. Our clients come to us for our expertise in lobbying strategies, policy analysis and the monitoring of regulations across European markets. While traditional transportation, such as trains and planes, have remained relatively "undisrupted", the broader mobility space has seen disruptive market entry from ride-sharing, ride-hailing, car sharing, electric cars, dockless bike sharing, electric scooters and new Mobility-as-a-Service apps. In early waves of these innovations, politicians and regulators were left scrabbling to respond to the concerns of taxi drivers, city authorities, road users and pedestrians. Recent years have seen a step-change in how authorities respond to new entrants, with scepticism and heavy regulation being typical, especially amongst local politicians in city administrations. At the same time, the automotive sector is in the grips of the most significant technical revolution since Henry Ford started up his production line. As manufactures respond to regulatory and market pressures to switch to electric vehicles there is an increasing focus on how to build and regulate the required charging infrastructure. Looking further ahead policymakers are starting to focus on the connectivity requirements for vehicles to interact with smart roads and cities and with each other as autonomous vehicle technology becomes a reality. It has never been more important for companies in the mobility space to scale their political and policy engagement to match their commercial ambitions - local, national and regulatory stakeholders cannot be taken for granted or ignored while a company is scaling-up. We tailor our support to the needs and available resources of our clients, providing early warning of regulatory threats, analysis of political risks, and strategic options to respond and lead. The urban mobility sector is developing so rapidly that just keeping up-to-date is a challenge for anyone in the industry, especially those with multinational ambitions. We created our weekly Sector News Summaries to meet this challenge. 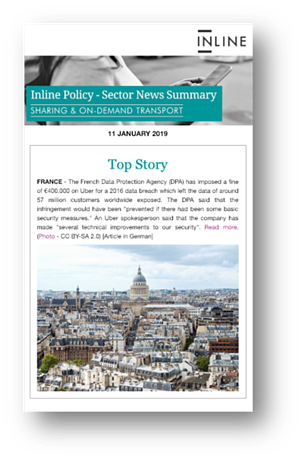 With a readership across the leading players in each of these sectors, the News Summaries provide coverage of all the major regulatory, commercial and policy developments around the globe. We offer a two-week free trial subscription which you can sign up for on our Sector News Summaries page.